There have been some murmurings from husband since I have introduced the lower carb and lower saturated fat diet, which has meant more veg, fish, weird pasta made out of things that probably shouldn't be in pasta, less meat and particularly less red meat like his beloved lamb. Summa summarum: girl food. Some meals have induced the question "What is this? ", which usually is not a good sign, even if asked with a curious rather than a judgmental tone. And I managed to cause a bout of constipation by hiding chia seeds in meatballs. And then there was baklavagate. We had some baklava left over from a dinner I prepared for some of his family who were visiting London and came to us for a Middle-Eastern feast. The following evening I heard his anguished shout from the kitchen "Why didn't you hide the baklava, now I've eaten it all!" I rushed to his aid, ripped the baklava plate from his sticky, sugar high shaky fingers. The damage was extensive, but not devastating. He hadn't eaten all of it, but quite a few pieces. I decided to bin the rest (they were those shop bought super sugary and greasy ones, definitely not designed for a healthy diet). Husband pleaded for another piece before I binned the rest (he actually threatened to take the plate out of the bin and eat all of it if I didn't let him have one more little piece) - I caved in and gave him half a piece. You should see him in his pleading mode, worse than a Labrador puppy with his misty brown eyes. Husband manfully negotiating over some baklava. So to ease the pain of the healthy diet I realise a well timed proper man meal with a big slab of meat is in order. I've never been a great steak chef, but have managed to get them right in the pan a few times. Recently I decided to get brave with the barbecue because we've had some nice weather. My first effort was two large and juicy ribeye steaks. I had been planning to make them for dinner on a Saturday and had asked for some tips from a friend who is a great cook. As advised I had taken them out from the fridge in the afternoon to get properly to room temperature before cooking that evening. But then I thought with the late brunch maybe we would want to have a light dinner, like fish and veg. So I ran this past husband. "Well, let's have a look at those steaks at least", he said audaciously and I showed him the steaks. He weighed the steaks in his hands and said he felt he could manage one. Gravely he added that he probably should, in all honesty, since he was losing weight at an alarming rate. He invited me to try how very bony his shoulders have become. As a dutiful wife I poked him in the shoulders and agreed that yes I could definitely feel some bone and an injection of protein was the ticket. Since then I have barbecued steaks many times and they have turned out fantastic without fail. 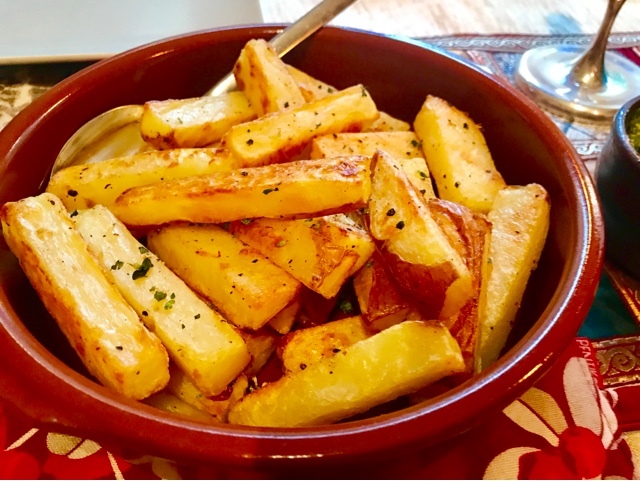 I have always served them with my home made oven chips and some healthy but delicious sides, no double deep-fried chips and buttery sauces for us. 1. Take the steaks out of the fridge to get to room temperature well in advance, like 3-4 hours, not half an hour before you plan to cook them. 2. Prep the steaks by removing as much of the fat as you want. Get rid of at least most of the "eye". You can do like Jamie Oliver if you are not worried about the saturated fats and rip the fat into little pieces and push back to the meat all around the steak. It will melt and fall away for the most part while cooking. At this stage you can also add any herb you like, chopped fresh rosemary or thyme will work nicely. Rub with oil and season with pepper, but don't add salt yet. 3. Get the coals really hot. 4. Cook 3 minutes on each side for medium (depending on the thickness of course). You can season with salt at this stage, once you have turned the steak once add salt on the cooked side, and once you have cooked the other side, add salt on that side. 5. Rest in a warm place under tinfoil and kitchen towels to keep hot for about 5 minutes before serving. 6. 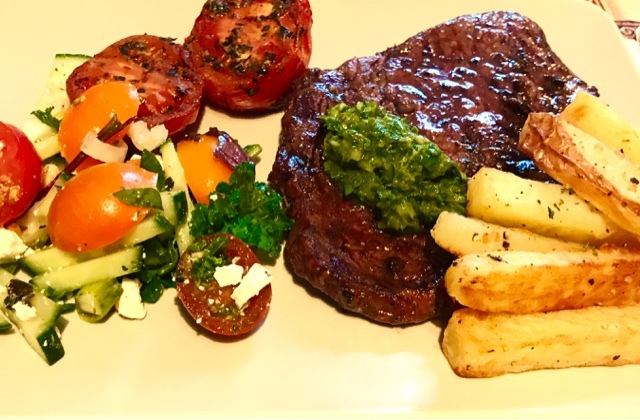 Serve with home-made oven chips, chimichurri, grilled tomatoes and a Greek salad with low fat feta or your choice of sides. 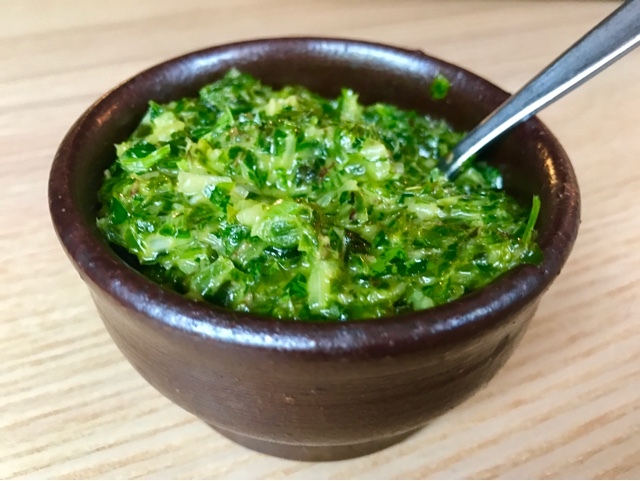 To make the chimichurri, blitz all ingredients in a food processor. Season to taste.